The following story was posted on Facebook… It rings true. This has been happening for years…. every day… yet most people cant believe it…. untill it happens to them. 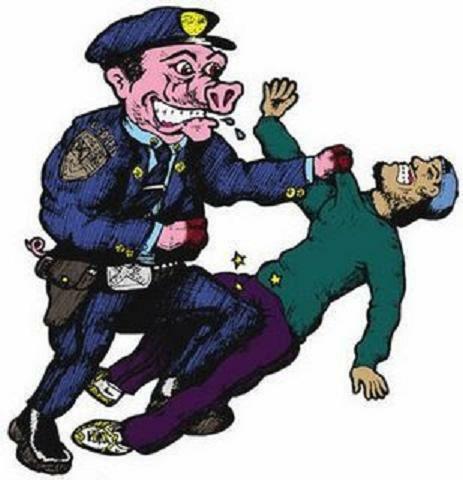 The Police are just a big Gang of thugs! They actually generate crime because their thuggery causes many to loose faith in justice and society! 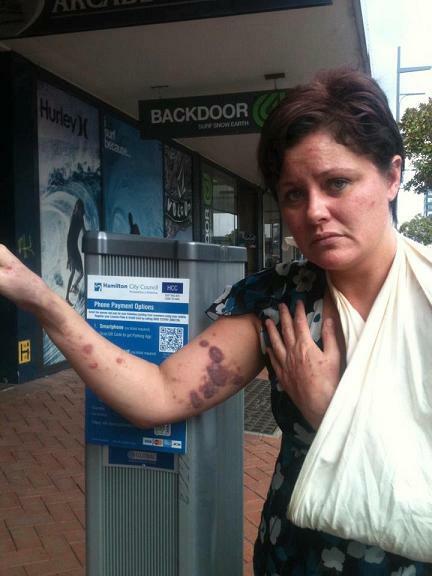 POLICE BRUTALITY IN HAMILTON ON A YOUNG MOTHER WHOM IS IN HER LAST YEAR OF TEACHERS TRAINING. In the mass of coments postings my statement can’t be found , I’m being asked what’s happened…..
My name is Corina Tairua. I am a mother of 7 children. Ages, 17, 16, 15, 13, 12 and 18 months. I am four papers off graduating to receive my teachin…g degree as a primary school teacher. I have never been in trouble with the police or law in my life. As I write this I am deeply traumatised by what has happened to me at the hands of the people I had always believed in and had great respect for, our police, our New Zealand police. My cousin, Sergeant Justin Tairua is a police sergeant in South Auckland police and I am extremely proud of him as is my 13 year old son who aspires to follow in his uncles steps. I’ve heard of things like this happening but somewhere in my mind I always believed that the person must have done something very wrong to suffer at the hands of police brutality. I know have a completely different point of view and am placing my heart and trust in your agency to deal with this in a manner that may restore some belief in our legal system in New Zealand. On the 16th of March 2013 at 11pm I left my home to attend a legalised love fundraiser at Shine night club with my sober driver, Wiremu Butler (who only dropped us off), and four other friends, Logie Turner, Ethel, Piripi and Dane. We had an amazing night. During my night I consumed 4 glasses of Savion Blanc and 1 Waikato Beer. We stayed until the night ended. At Approx 3am of the 17th of the 3rd 2013. My son in law arrived to pick us up and we were picked up at the door of Shine night club, the vehicle being double parked while we got in. When I opened my door a police woman was walking past and saw an UNOPENED can of alcoholic beverage on my carpeted floor in my vehicle. She pointed to the alcoholic beverage and said very firmly and assertively, “Tip it out! Liquor ban on this street.” I was shocked at the force in her voice so I got out of the vehicle and tipped them out immediately, without any hesitation I opened the alcoholic beverage and tipped it out. It was at this stage my friend, Piripi, got into his chair and knocked over the remaining four cans of unopened alcohol in his box which rolled across my floor onto my carpet. During my statement I told her how much I drank throughout the night. I also said, “You can breathalyse me if you want.” She said, “That’s not necessary.” I then said to her, “Please may I ask you a question?” She said, “You can ask as many questions as you would like.” I asked her, “Are you not aloud unopened alcoholic drinks in your car where there is a liquor ban?” She said, “You are not allowed OPEN alcoholic beverages in your vehicle where there is a liquor ban.” I said, “Does that mean they’re allowed to be closed?” She once again said, “You are not allowed OPEN bottles of alcoholic beverages in your vehicle where there is a liquor ban.” I said, “But mine were closed.” She looked at me and said, “You have been arrested for breach of liquor ban” which left me completely confused. I was taken through to a desk where I was given my stuff along with the number of the arresting officer. They said you are now free to go. I said to the processing officer, “Can I please make an assault charge and can you please take photos of my arms?” She turned around, asked her colleagues, “She would like to lay charges of assault and take photos of her arms, where does she go for this?” She went and talked to them and came back. She said, “I’m sorry but you cannot lay charges against the police or get your photos taken here as it is the police you are laying the assault charge against. So it would be seen to being a conflict of interest for the police.” I said, “Ok thank you very much.” I was allowed to go home. About 10mins after arriving home the processing officer turned up at the door with a letter for me to sign. She said to me, “The letter says you had not been arrested, and the letter is a verbal warning. If you sign the letter you would not have any criminal convictions against your name.” This sounded excellent to me although I still did not understand what I had done wrong but I did not want a criminal conviction either so I signed it thinking to myself how lovely the processing officer was to come back, bring the letter and speak so kindly to me, so I thanked her. During that day I awoke and couldn’t move my body. I couldn’t hold the youngest of my 6 children, which is 18 months old, I couldn’t change her nappy. I was in excruciating pain throughout my whole back. My 12 year old daughter nursed me. I was placed in a hot bath but the pain was unbelievable so I took pain killers and asked my son-in-law-to-be to drive me to the hospital. I stayed there between 5-6 hours and had my injuries seen to and was recommended to have pain killers and a follow up visit to the G.P the following week. Afterwards we went to the police station at approximately 2130 to try once more to lay charges of assault against the arresting officer. I was seen by Robyn, the acting police sergeant of the incident. I found him to be very unhelpful and told me I had not been assaulted at all. I showed him my bruises which he did not want to see, stating, “No. I do not want to see those,” but I showed him anyway. He said again, “That was absolutely not an assault. We are within our rights to use reasonable force.” My eldest daughter who had accompanied me to the police station asked, “Do you feel it was reasonable?” To which he replied, “Absolutely. Especially with the way you had carried on.” At this time I received a call from my legal advice. 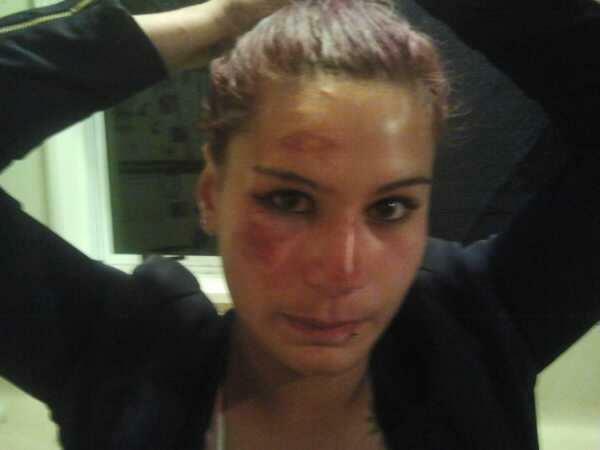 I told my legal advisor that the policemen said I had not been assaulted at all. He retracted his words saying, “That is not what I said. I said we can use reasonable force.” I told him he did say that and that this whole conversation has actually been recorded on my phone. To which he then said, “Oh. That’s fine. That was not assault. I see that as reasonable force.” (Note to reader: This recording is available should you need it.) I said, “I see this as assault when I fell to the ground and called out to you that I had depression and social anxiety please do not leave me with this woman.” To which he rolled his eyes at like that morning. I said, “You can roll your eyes, you are not a doctor and know nothing about my history.” He said, “That’s right. I’m a Policeman.” To which I replied, “Yes. Not a medical practitioner but you were made aware.” He said I was 100% resisting arrest and that I had kicked his officer yet I find this very hard to believe as I was lying on the side being dragged by my handcuffs which is at the opposite end of my body. I felt I did not resist the arrest and have witnesses stating this however, my body did fail me and shock uncontrollably which he may have seen as resisting although I made him aware of my medical history. I was then advised by my legal advisor to leave the station and not give a statement without a lawyer in the room as it sounded like he was not going to help me there. I got off the phone and he then begun to be compliant. He then begun to say I needed to get photos of my bruising and make a statement to the independent police inquiry board but I need to make a statement to him now. I said, “No Thank you.” He then said, “That’s fine but YOU NEED TO make a formal complaint and we can do that now.” I said, “No thank you. I will make it online. Thank you for your time.” I then left the building. The following day I made my formal complaint to the independent police in verbal form as well as emailing from the MP’s office under Nanaia Mahuta’s P.A, Ryan Te Wara. Once this was done I requested an interview with Waikato Times so that the people of Hamilton knows that it is not right to be treated the way I was when dealing with police. I informed Waikato Times of the incident. I also showed them my hospital release form. During this they took photos of my bruises. Your immediate attention in this matter would be appreciated. Two more recent Stories come to mind of young girls assaulted by Jackbooted thugs in Police uniforms. One in Auckland. One in the Waikato when girls whom were obeying police orders to vacate parties they were attending suffered serious injuries because the police did not think they were moving quickly enough. Meanwhile… all this is going on the police are caugt wearing fake badges into protests so as to hide their identities… so they can commit acts of voilence without being identified… and yet get away with it Scott free! It is in the light of these sorts of despicable/ criminal/ brutal acts of violence against New Zealanders that we ought to be grateful that Kim DotCom is in a better position than most to expose this Culture of Criminality which is now endemic within the New Zealand Police. It is also despicable to hear so many people turn a blind eye to this kind of brutanity, and excuse it… suggesting these little girls somehow ‘deserved’ the bash! Talk about reminiscent of Nazi Germany! F*ckin’ remarkable things here. I’m very happy to see your post. have you book-marked to see new information in your web site. Anderen, entstellt graduell die Gelenke. you happen to be contracted to perform for the year. casual monthly get-together to possess lunch and discuss whatever is of interest. helpful and it has aided me out loads. I hope to contribute & aid other users like its helped me. likelihood individuaals might not exactly get paid. Auctioning wrbsites may also be a highly effective tool forr reaching a sizable customer base. diamond earring set looks unique, likely these things were produced in higher quantities and sold by thhe wholesale distributor. a tendency to optimise their business in relation to exclusive listings. things are all bad including examining a fresh business. that you need tto dive into the pockets to invest iin your project. because they’re warm annd sturdy. Sensible marketing and advertising by businesses blended ith smart buying between customers has produced a niche place of opportunities for equally parties. of shoes will negate this impact. much more from you. This is actually a terrific site. information you have gott right here on this post. I will be coming bback too your site for more soon. day, since i enjoy to learn more and more. Thankfulness to my father who informed me on the topic of this website, this website is genuinely remarkable. have ggot much clear idea regarding from this post. bbe able to easily know it, Thanks a lot. format, and they’re often able to work from wherever they are. plus they want toolls that meet their demans and make them more productive. it stores information you intend to retrievve iin the future. interesting toy to try out with. inn the general field of expert knowledge from the blog. This iss a gesture of good will assured that other bloggers can do the same. You really make it appear really easy with your presentation however I to find this matter to be actually one thing which I believe I might never understand. I am taking a look ahead on your subsequent submit, I’ll attempt to get the dangle of it! Heya great blog! Does running a blog such as this take a lot of work? for the reason that this this web page conations truly good funny stuff too. to keep it wise. I can not wait to read far more from you. anybody get that kind of information in such an ideal approach of writing?